In the Egyptian Museum, Downtown, Cairo. 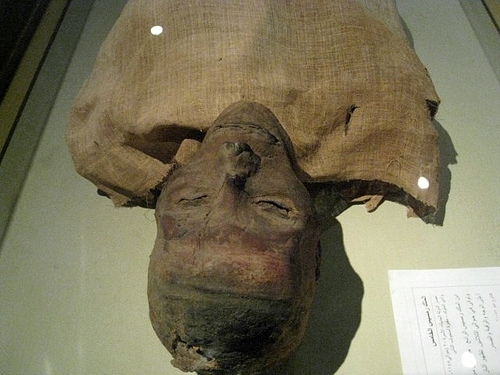 After death, the pharaohs of Egypt usually were mummified and buried in elaborate tombs. Members of the nobility and officials often received the same treatment, and occasionally, common people. However, the process was an expensive one, beyond the means of many. 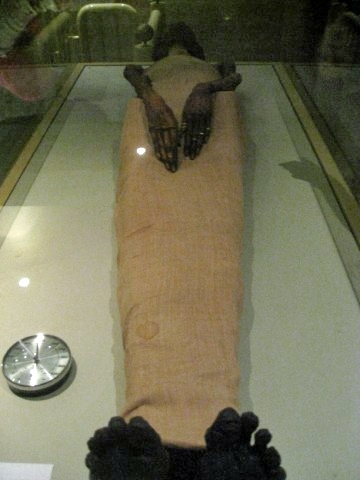 The methods of embalming or treating the dead body, that the ancient Egyptians used, is called mummification. Using special processes, the Egyptians removed all moisture from the body, leaving only a dried form that would not easily decay. It was important in the religion of the Ancient Egyptians to preserve the dead body in as life-like a manner as possible. So successful were they that today we can view the mummified body of an Egyptian and have a good idea of what he or she looked like in life, 3000 years ago. Mummification process took seventy days. Special priests worked as embalmers, treating and wrapping the body. Beyond knowing the correct rituals and prayers to be performed at various stages, the priests also needed a detailed knowledge of human anatomy.